Hello my peeps! That’s right I called you my peeps! Someone mentioned Easter earlier today maybe that’s why I’m thinking about peeps…I digress. I have some super cool polishes for you and let me tell you these are the kind of polishes I dig…full of glitter and sparkle and wonderfulness. Plus how could I not want to get some polishes called Polish Addict?! I *am* the head polish addict around these parts! First up without further fanfare and without further ado. Keep Calm I’m a Polish Addict! 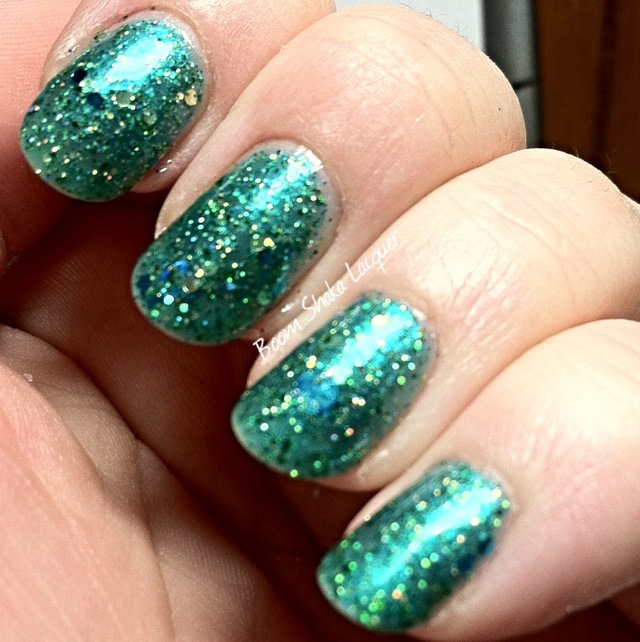 Keep Calm is a glitter topper of epic proportions. There are so many kinds of glitter in different finishes and colors that I seriously think that it would look amazing over any color. I showed it here over a variety of bases to give you an idea of the variety that can be achieved. Some of the glitters I can pick out are big metallic and holographic dots, big matte dots, medium metallic and matte hexes, tiny hexes and microglitter in a plethora of colors! These pictures show one dabby coat over undies. I didn’t have any problem coming up with a wealth of glitter at each dip. I did turn the bottle over for a few minutes before hand as some of the heavier glitters (as per my past experience with larger glitters in other brands) tend to just naturally move to the bottom. I lightly dabbed a coat on instead of using strokes so that I didn’t just pull all the glitter to the tip of the nail. I had no problems with the formula on this at all! *Squee* it’s so pretty! 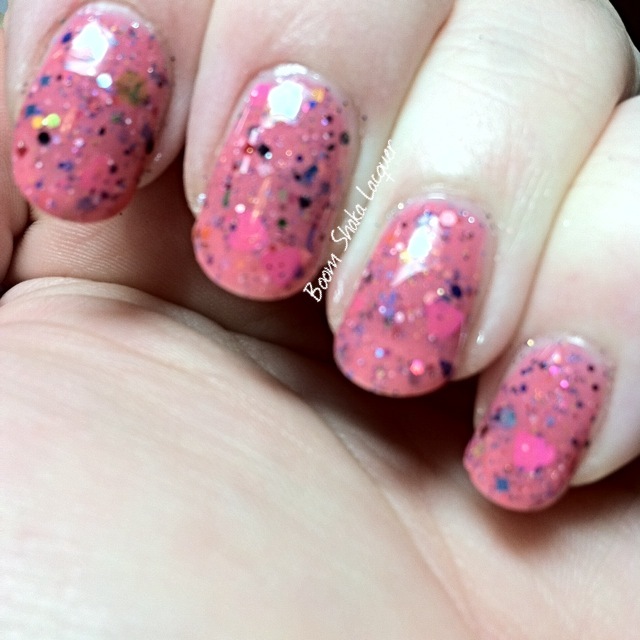 I <3 Polish is a delightful Barbie pink crelly/jelly polish with another heaping helping of glitter and shreds. 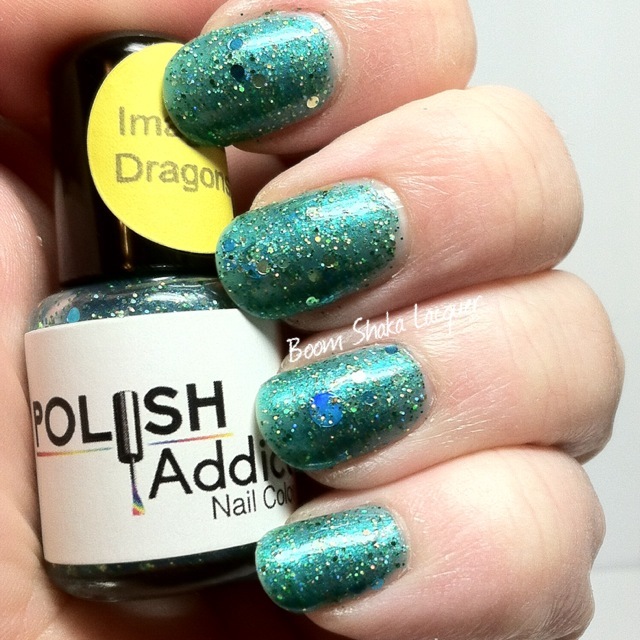 Mostly smaller glitters in this one in a ton of different colors. My favorite though are the hot pink hearts! The formula on this is good. The picture shows just two coats and is fully opaque even though I worried I might need three after the first one. The glitter spread nicely on this one and I managed to get a heart on every nail without even really trying (some nails have two!). BOOM. 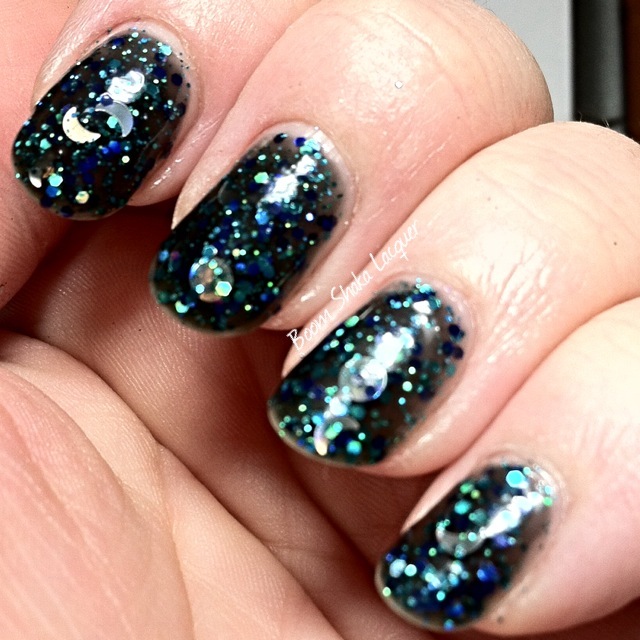 No my friends, that is NOT the night sky on my nails but I can TOTES see how you might think that! I love love this polish so much! Secret Galaxy is a charcoal gray jelly packed to the brim with blue and teal metallic and holographic hexes and microglitter along with a side of big holographic circles and moons! Know what else I loved about this polish? The formula and application! Really I expected to have to work at this one a little…funny shaped glitter, jelly base…yeah I expected it and I was so wrong! This is three coats without any undies and it went on so well! I did two thin coats and then a lightly dabbled coat mostly to make sure that everything was where I wanted it on the nail. Polishes used: Glisten & Glow – Stuck on Blu; Polish Addict Nail Color – Secret Galaxy; Carpe Noctem – Glitterslayer; Glisten & Glow – HK Girl Top Coat. Last but certainly not least is my favorite. Imagine Dragons! Now…look at it…isn’t it stunning??!! Could it be the shimmery teal jelly base? Could it be the gold metallic and holographic microglitter? Could it be the giant light blue metallic dots? Or is it the little round gold dots? I don’t know but they all just work together so harmoniously! By this point (this was the last one I swatched) I was hooked and was expecting a really great formula and I was not disappointed! Application on this was easy peasy lemon squeezy and the picture shows three coats without undies! 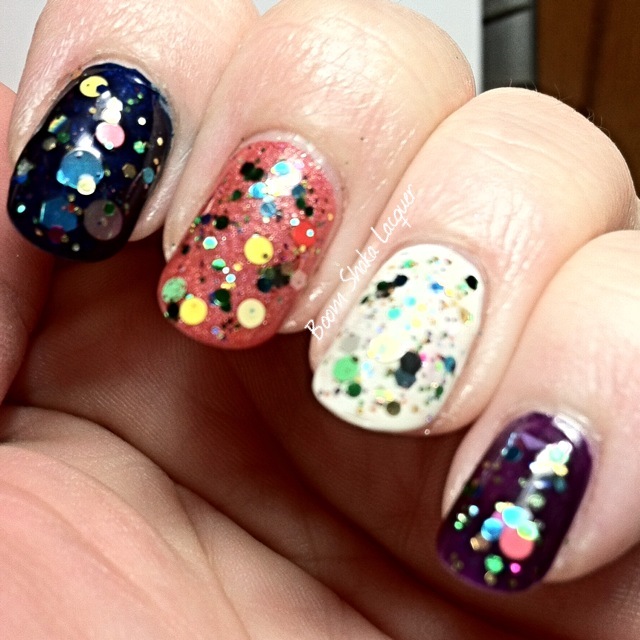 All in all…I think I’m in love with Polish Addict Nail Colors! I really want to try some of their white based crellies as well because well…I’m a sucker for a good white based crelly polish and I have no doubt that theirs will be magnificent! 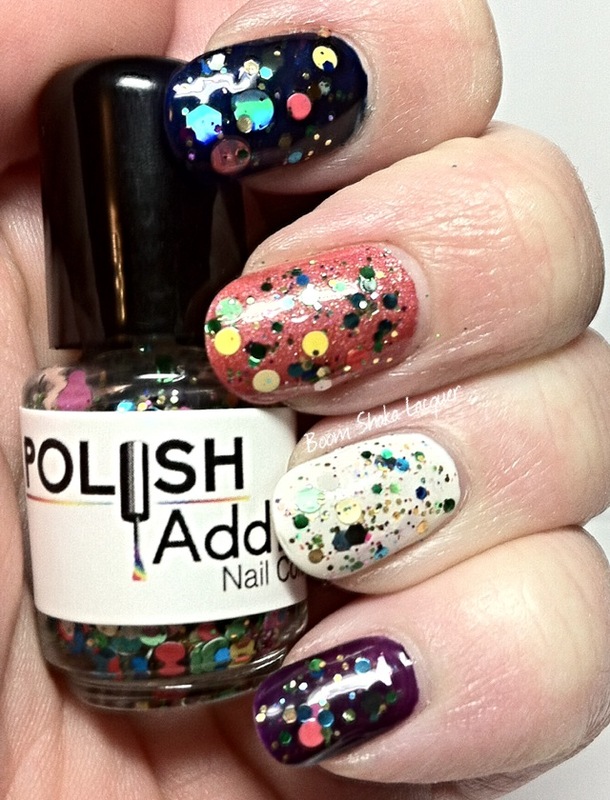 You can buy your OWN Polish Addict Nail Colors in their bigcartel shop. You can also find out all the lowdown on their Facebook Page and you can look at their pretty pictures on Instagram! Tell ’em Boom Shaka Lacquer sent ya! 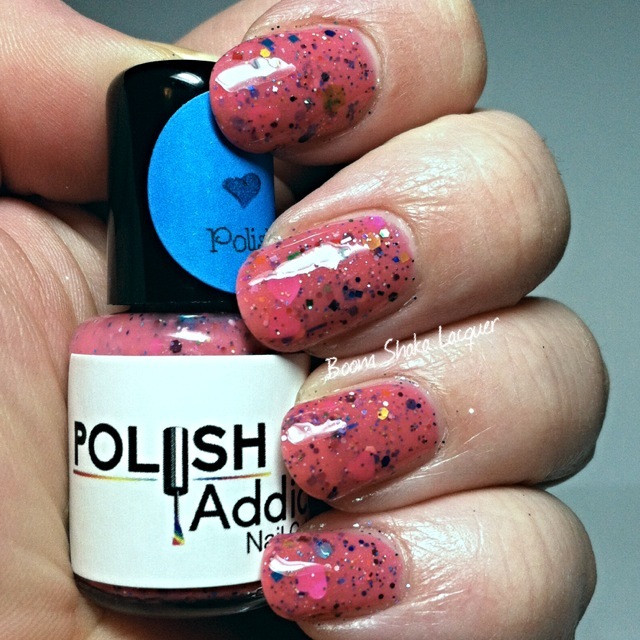 This entry was posted on February 6, 2014, in Indie Polish, Polish Addict Nail Colors.